GoDataFeed is integrated with 3dcart to provide seamless imports and updates from 3dcart to GoDataFeed. This allows you to continue managing your product data on 3dcart while GoDataFeed automatically retrieves the latest changes on a daily basis. Enter your 3dcart store's secure URL and click Save in GoDatafeed. 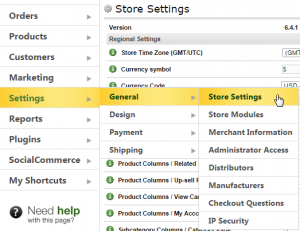 You can find your 3dcart Secure URL under Settings > General > Store Settings in your 3dcart store admin. You can find your 3dcart REST API under Modules. Click Add New. Enter GoDataFeed's public key (Provided on the import settings screen). Click Add. Save. Upon saving you will be prompted to import your products. To import products immediately, click Yes. To import products later, click No. You can find your 3dcart REST API under Settings > General > Store Settings. In REST API, click Change Settings.